Since our first post, car finance has risen up the agenda of regulators, journalists and policymakers. Here we provide an update on recent developments. Sterling’s depreciation has had little impact on car finance costs: first because pass-through to new car prices has been muted, and second because finance providers have responded by lengthening loan terms and increasing balloon payments rather than upping monthly repayments. Providers are increasingly retailing contracts where consumers have no option to purchase the car at the end. This avoids some risks associated with voluntary terminations, but it creates new risks around resale value. In sum, the industry continues to accumulate credit risk, predicated on the belief that used car values will remain robust. In a PCP contract, the buyer does not initially take ownership of the vehicle, but instead makes a cash deposit and typically rents it for 3-4 years with an agreed annual mileage. The renter’s monthly payments cover the vehicle’s depreciation plus the lender’s interest costs and profits. At the contract’s end the renter can return the vehicle to the finance provider. Alternatively they can make a final “balloon payment” to secure ownership, known as the vehicle’s Guaranteed Minimum Future Value (GMFV). The GMFV is fixed when the PCP contract is signed initially and broadly equates to the lender’s best guess of the car’s market value at the contract’s end, discounted to allow a margin for error. Setting the GMFV is a difficult balancing act. If it is set too low (perhaps because the lender anticipates high depreciation of the vehicle), then car finance costs increase for the consumer — perhaps making the deal unaffordable. But if set too high so the market value of the car at the end of the contract is lower than the GMFV, the lender risks losing money if the vehicle is returned. Chart 1 shows a stylised example. The car’s purchase price is £20,000 and the buyer makes a £3,000 deposit, followed by 48 monthly payments of £187.50. The balloon payment is £8,000. 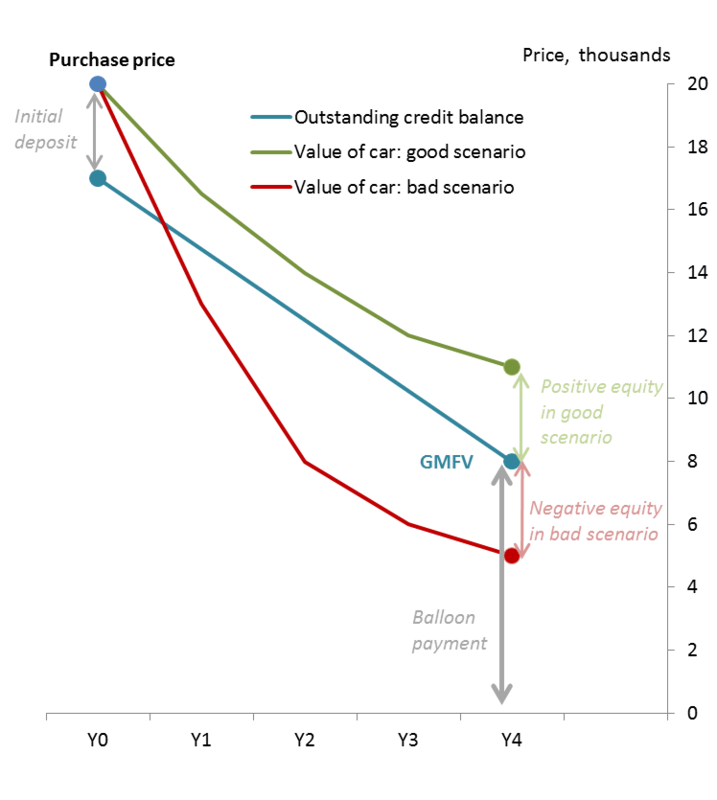 If at the end of the contract the market value of the used car (ie its “residual value”) is lower than projected by the finance house, the vehicle may be in negative equity: its market value is less than the amount of outstanding consumer credit (the red line is below the blue line in year 4). If the vehicle is returned, the lender makes a loss. Private demand for new cars slowed in 2016 (Chart 2). New car registrations spiked higher in 2017 Q1 — mostly due to changes in vehicle excise duty — but fell back sharply thereafter. 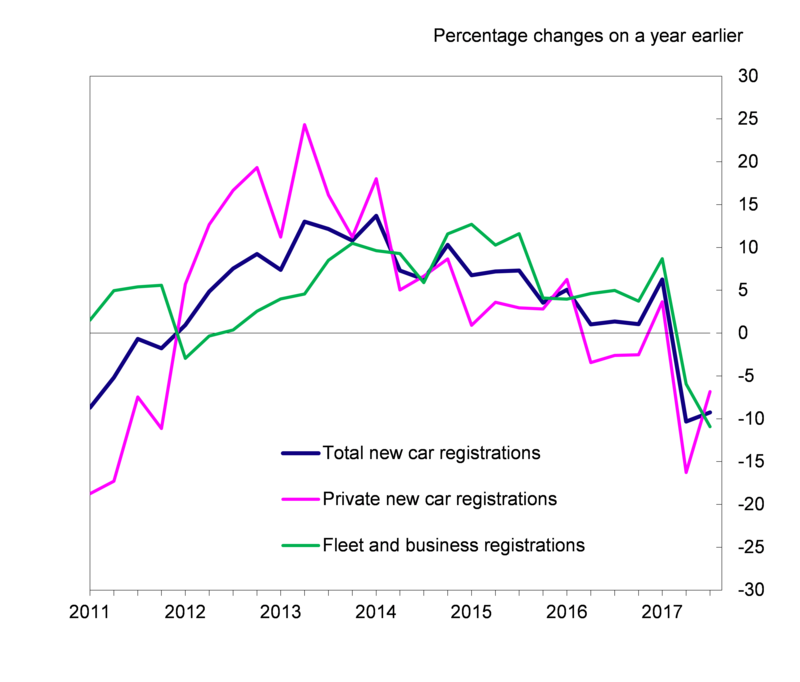 The Society for Motor Manufacturers and Traders (SMMT) forecasts total new car registrations declining by 2½% in 2017 and by a further 4% in 2018. UK car registrations were 2.7 million in 2016. UK car production was 1.7 million units, of which nearly 80% were exported. So car imports accounted for 86% of UK sales. Sterling’s 18% depreciation since its peak in November 2015 presents a serious challenge to overseas manufacturers, whose costs are largely denominated in foreign currencies but the sterling revenues from UK car sales now convert to 18% fewer euros etc. Over 80% of all new car loans are arranged as PCPs. Margins on PCP contracts have been falling recently. Intelligence from our industry contacts indicates that residual values (RVs) of used cars have been easing slightly over the past year or so, and perhaps by more than the industry expected. That reduces the profitability of PCP, with for example more cars still in negative equity at the end of their contracts. Our intelligence on trends in RVs of used cars is broadly consistent with official data (see Table B), which show annual price deflation of used cars of -2.3% in June. The industry is intensely competitive. Faced with weakening demand few manufacturers have preserved margins by fully passing on sterling’s depreciation. The degree of price increases needed to maintain margins is hard to estimate. Our intelligence suggests many manufacturers have staged a number of small price rises in the past year, with total increases of about 3-6%. That is broadly consistent with official data, which show annual price inflation for new cars of 2.5% in June. Given that 86% of cars are imported and sterling has fallen 18% since its peak, those figures imply quite a substantial margin squeeze. So further gradual price rises are likely, though it could take several years for margins to fully recover if exchange rates remain stable. (i) In cases where the car’s RV is weaker than the finance house had anticipated during the PCP contract, the point at which the car reaches positive equity is delayed. So the car dealer has to defer the time when it can offer the buyer a PCP contract on a new car. In consequence, the replacement cycle for new cars (ie the average length of time between new cars being purchased and sold) is lengthened. In addition, PCP tenors offered by the finance houses have started to increase. (ii) Manufacturers typically set the GMFV at around 90% of the projected second-hand value at the end of the contract, in order to build a safety margin into their calculations. Tweaking the proportion can have a material impact on the cost of car finance. Switching the GMFV from 90% to 95% would likely reduce the consumer’s monthly payment. Of course, increasing the GMFV without evidence of rising used car prices exposes the finance house to the risk of losses if the returned car has a lower market value than projected. (iii) There has been a steady rise in the use of PCH finance recently, although its market share is still only around 8%. The key difference with PCH contracts is that, unlike PCP, the consumer has no option to purchase the car by making a balloon payment when the contract expires; the vehicle is returned to the finance house. Finance costs and monthly payments are typically slightly cheaper under PCH than PCP. PCH contracts are popular with the manufacturers and finance houses for two reasons. First, PCH contracts are exempt from consumer protection legislation which allows consumers to return their cars part way through a PCP contract, provided they have paid at least 50% of the total amount payable. This removes an element of risk to the lender inherent in PCP schemes whereby consumers may return the car once 50% of the payments are made but when the car is probably still in negative equity. So-called voluntary terminations are increasing, and usually result in losses to the finance houses. Second, cars sold with PCH include bulk sales to leasing companies, which in some cases are then sold on to consumers. Because the cars are being sold wholesale, prices are slightly lower price than in the retail market. 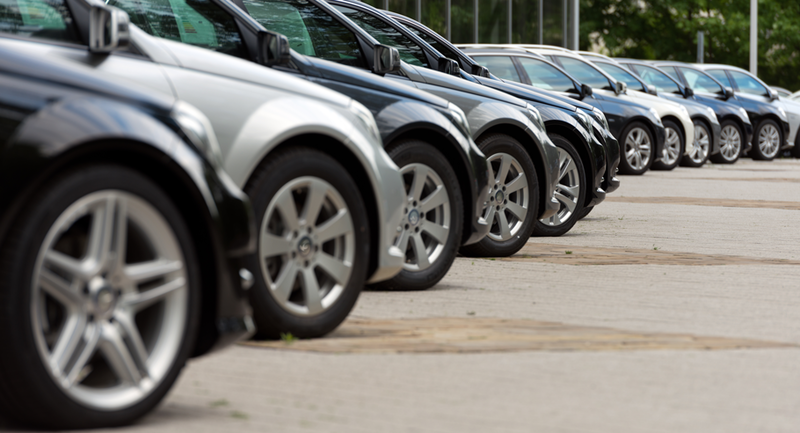 Greater use of PCH has certain risks attached for car finance houses. The primary risk inherent in PCP finance (ie the car’s uncertain market value when returned at the end of the contract) is at least as great under PCH. And a business model of increasingly relying on volatile and lower-margin wholesale markets to sell cars adds to the risk. (iv) Manufacturers often vary the amount of cash support to car dealers in order to meet sales targets — sometimes referred to as variable marketing programmes. If a manufacturer is falling behind its (typically quarterly) sales budget, cash incentives may be offered to dealerships to meet more demanding targets in the following quarter, in order to clear surplus inventory and get back on track. Our intelligence suggests that dealership incentives have increased over the past year. Although weakening, UK new car sales remain at historically high levels. That is partly because car manufacturers and their finance houses are increasingly stimulating private demand by offering cheaper (and new) forms of car finance. As amounts of consumer credit increase, so do the risks to the finance providers. Most car finance is provided by non-banks, which are not subject to prudential regulation in the way that banks are. These developments make the industry increasingly vulnerable to shocks. Tim Pike, Phil Eckersley and Alex Golledge work in the Bank’s Agencies Division. 15 August 2017: Text updated to clarify that car finance providers are not subject to prudential regulation by the PRA. They are regulated by the FCA. An additional vulnerability is the diesel sector, which over recent years has been a very fast growing segment of the new car market. The growing realization that diesel vehicles are not as clean or economical as many – both the government and the public – believed to be the case will put further downward pressure on residual values.